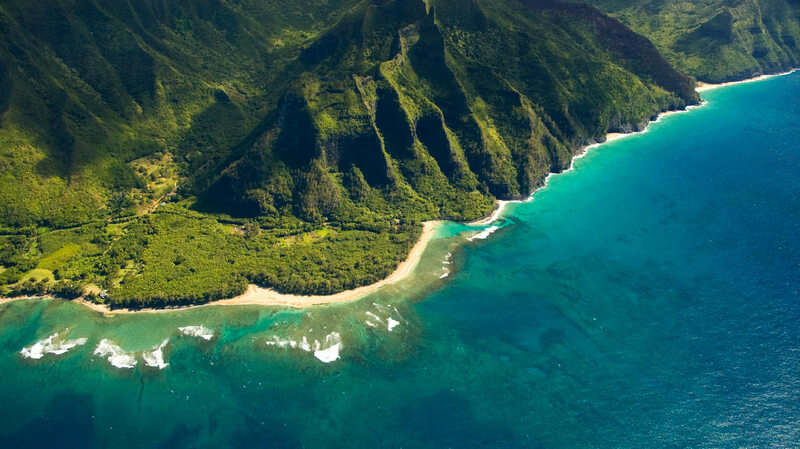 Big Kahuna :: Our Most Popular Kauai Air Tour! *Note that your actual air tour route may vary based on tower instructions, weather, or any other condition which could effect the safety or comfort of our passengers. Click for more information about this incredible vacation value! 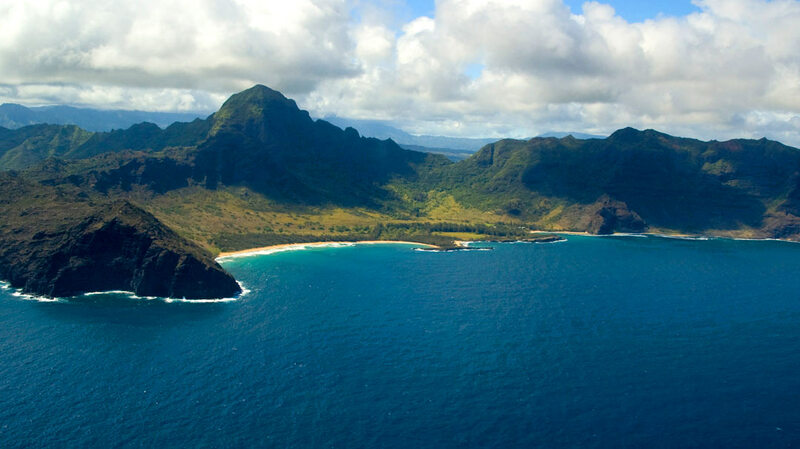 Our most popular Kauai air tour encompasses the entire Garden Island. Enjoy views of the Menehune Fish Pond, the Eucalyptus Tunnel of Trees, Waita Reservoir (the largest reservoir on Kauai), Captain Cook’s Landing in Waimea Town, the breathtaking Waimea Canyon, the majestic Napali Coastline, Lumahai Beach (were the movie “South Pacific” was filmed), Hanalei Valley, beautiful cascading waterfalls, Kilauea Lighthouse (the largest frigate bird sanctuary), and miles of stunning coastline and beaches. 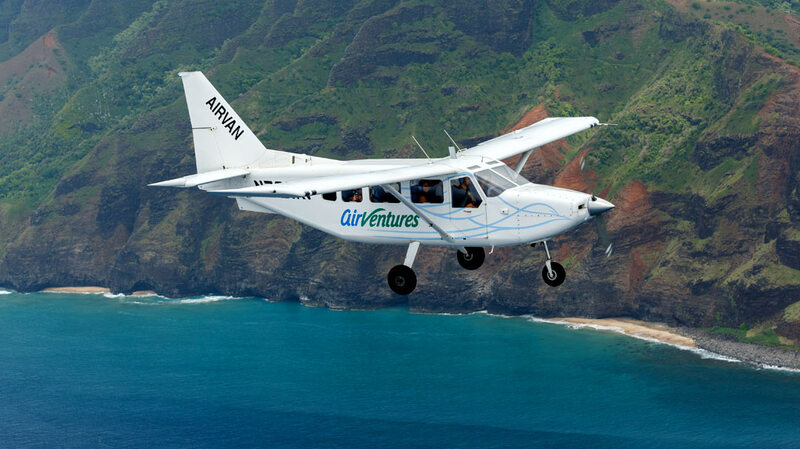 When you travel with AirVentures, you’ll be flying the most eco-friendly Kauai air tour company. 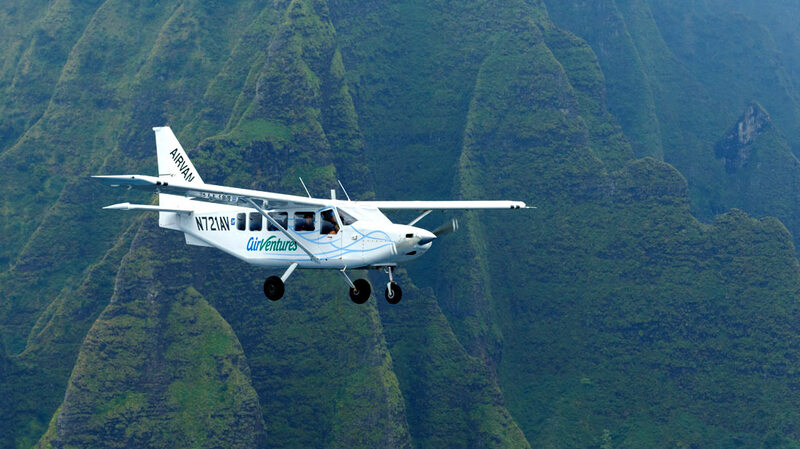 Our Airvans use only a fraction of the fuel that a typical helicopter consumes, which translates to cost savings for you – save up to $100 per person compared to a typical Kauai helicopter tour. AirVentures Hawaii is also unique among Kauai airplane tours, because they can accommodate up to six people per flight and have a generous 350 lb. per passenger weight limit on their two GA-8 Airvans. The Airvan is a very spacious aircraft (there are no “middle” seats) and every seat has a extra-large bubble window specifically designed for sightseeing and photography – so everyone can enjoy the view. 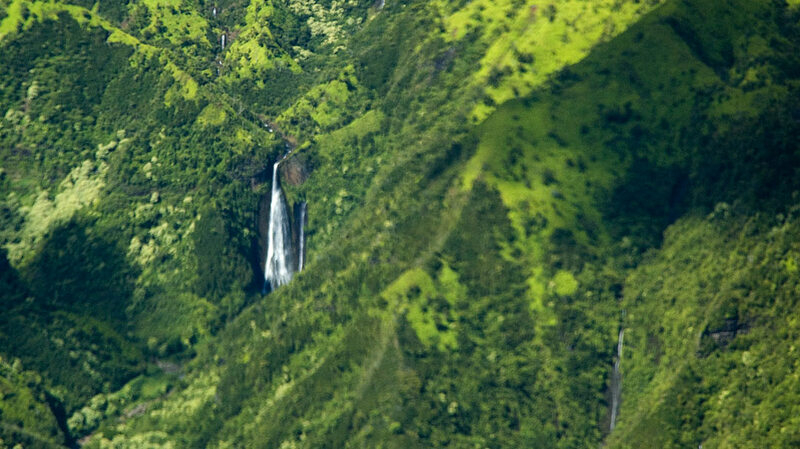 The airplane’s slower speed allows optimal exposure time for viewing Kauai’s most awesome features. And, you’ll share the experience with your fellow passengers through two-way noise reduction headsets as our friendly pilots share the legends and history of Kauai during your flight. Traveling with a group of six or more? We offer group rates and are happy to provide you with side-by-side flights in our two GA-8 Airvans if needed. These special group rates are only available by phone so please call us on our toll-free line: 1-866-464-7864. Special group rates are not applicable to our already discounted combo tours. 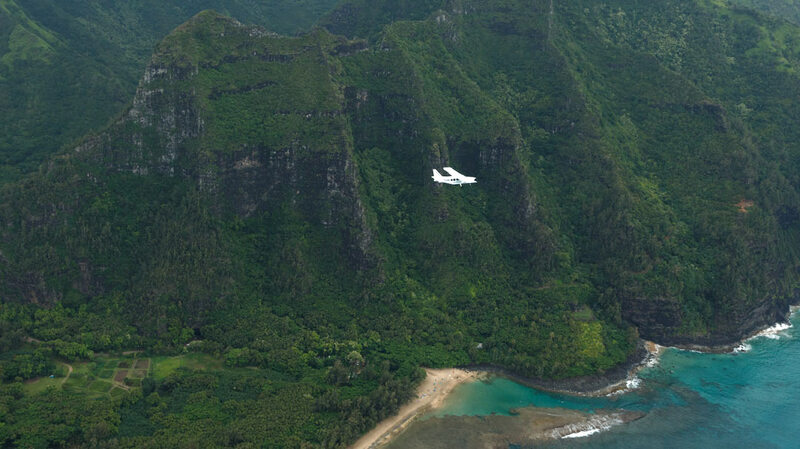 Beyond our popular Kauai air tours, we are able to offer private charters which allow you to “go where you want” (within reason, of course). The GA-8 Airvan’s slow flying and stable characteristics make it a great low-cost platform for photography and video – from scenic shots, to aerial job site documentation, to crop surveys – we’ve done it all. Please call us for pricing on these special tours. The Airvan is a very spacious aircraft (there are no “middle” seats) and every seat has an extra-large bubble window specifically designed for sightseeing and photography – so everyone can enjoy the view. 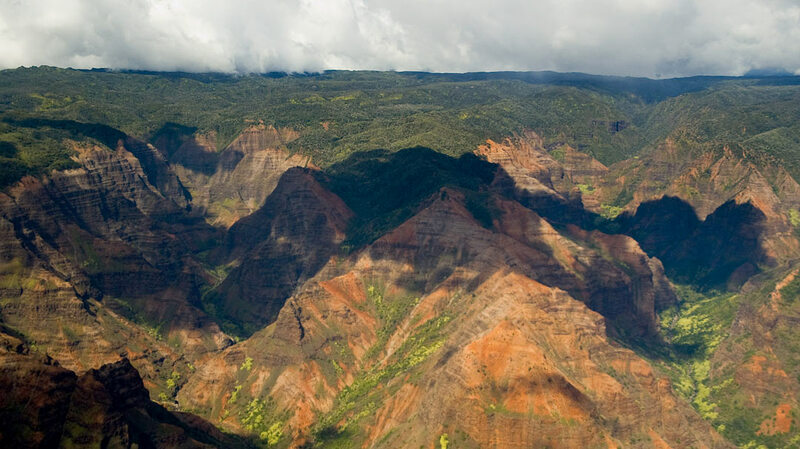 The airplane’s slower speed allows optimal exposure time for viewing Kauai’s most awesome features. 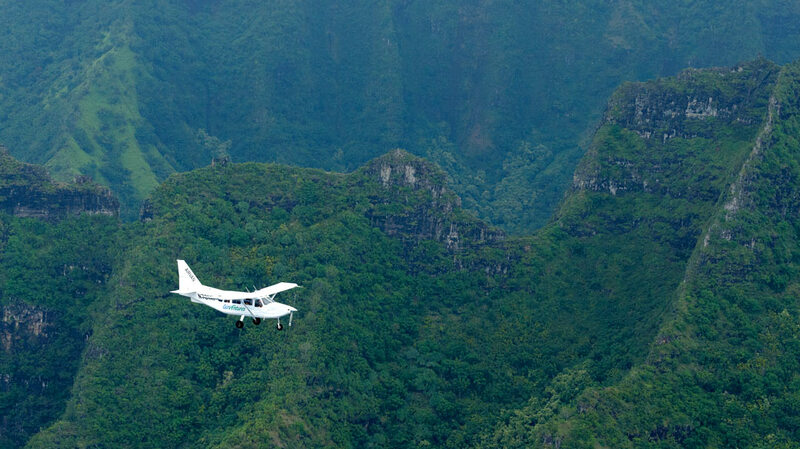 And, you’ll share the experience with your fellow passengers through two-way noise reduction headsets as our friendly pilots share the legends and history of Kauai during your flight. What is the difference between a helicopter tour and an airplane tour? We are both regulated by the same FAA routes. We both fly between 500' AGL to 1,500' AGL and our flights are usually smoother because we fly above the valleys and canyons. We offer extra-large window seats fat no extra charge for all passengers, unlike helicopters which have three middle seats. We also have a more lenient weight restriction of 350lbs per passenger on the GA-8 Airvan, and 270lbs per passenger on the Cessna .The Biplane limit is 500lbs total for two passengers; however, you must be able to sit confortably side-by-side in the 35 inch cockpit. On helicopter flights, passengers must pay an additional charge if they weigh over 230lbs. Our tours are a full 60 minutes long unlike helicopter tours which are between 45-52 minutes of flying time. We are the most cost-effective way to see the island. Yes, we provide complimentary transportation for cruise ship passengers, to and from the ABC Store at Anchor Cove Mall and Harbor Mall, upon request. Are taxes and fuel surcharges included in the price? What if the weather is bad? Do we get a refund? Should your flight be delayed or canceled due to inclement weather, we will make every effort to reschedule you. In the event that rescheduling is not possible, you will receive a refund. We recommend you book your tour to fly early in your stay. We definitely do not want you to miss seeing our beautiful island from above. Although gratuities are not included, it's always appreciated and customary to tip your pilot. Will I see as much from the airplane as in a helicopter? You will actually see more of the beautiful island of Kauai because you will get a panoramic view, unlike helicopters flying below the ridge lines which may obstruct your view. Our tours are a full 60 minutes in length unlike most helicopter tours which average approximately 48 minutes. Will I see everything in your tour description? Every attempt will be made by our pilots to cover each site described, weather permitting. Pilots will adjust their flight path for wind and weather and may include alternate sites. 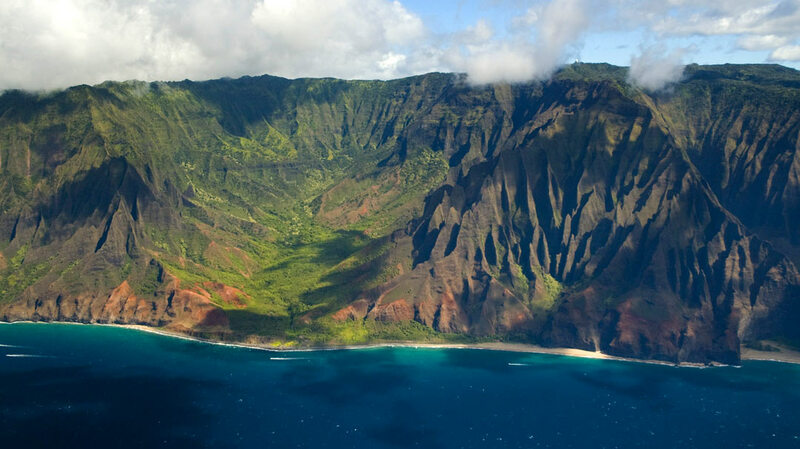 You will have the very best air tour of Kauai possible on the day of your tour! However, your safety and comfort come first! How is your safety record? We have a perfect safety record with no accidents or incidents. How long has AirVentures been in business? We have been "Flying with Aloha" since 2004! We recommend you wear comfortable clothing. If you are comfortable on the ground you should be equally comfortable in the airplane. Should we bring a camera? Yes, we encourage passengers to bring their cameras. You will achieve beautiful photos with any lens. We can also mount your Go-Pro on the exterior of our airplane for a fee of $25.00, should you desire it. What is the best tour? 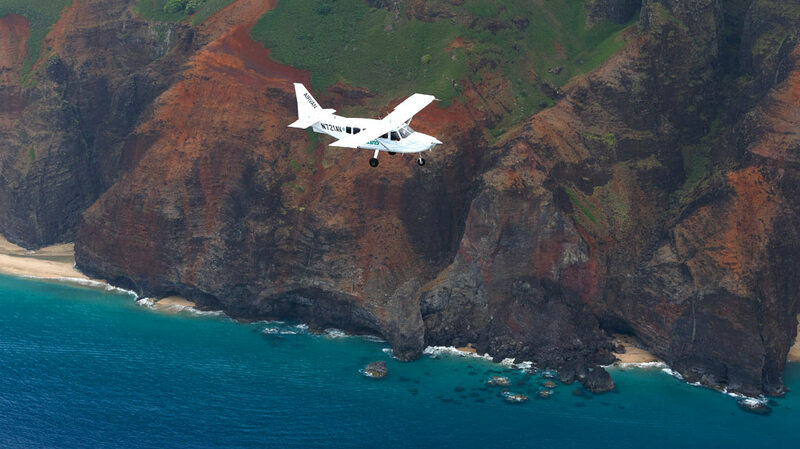 Every Kauai air tour we offer encompasses the entire Island. You will experience Jurassic Falls, Waimea Canyon, Napali Coast, Kilauea Lighthouse, Hanalei Valley, Waialeale Crater, Wailua Falls, Opaekaa Falls, Kilohana Crater and much, much more. 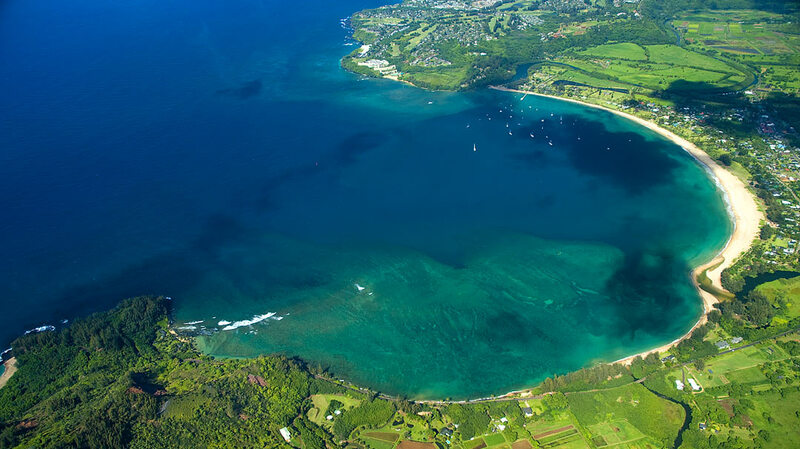 Our most popular tour is the Big Kahuna Tour because it is our most cost-effective tour. How many people does the Airvan hold and what are the seating arrangement? Our two GA-8 Airvans each hold six passengers with an aisle-way between passengers. Every seat has an extra-large bubble window for excellent photography and viewing. A 48-hour cancellation or change of tour notice is required for all airplane tours. If for any reason you decide to cancel or change your reservation, you must notify us 48-hours prior to the tour date/time. Cancellations, changes, or no-shows within 48-hours of the tour are not refundable and will be charged in full. Routes and flight patterns subject to change due to weather conditions. Total fares include applicable taxes and fees. Any child under 24 months of age is welcome as a lap child at no charge. Children 24 months and over require an individual full-fare seat. There is a 350 pound per passenger weight limit. Your credit card will be charged at time of booking. My experience left me speechless! This tour was the best way to see and appreciate the garden island of Kauai! Our pilot was very knowledgable of the history of the island and made sure we were comfortable and saw every waterfall.